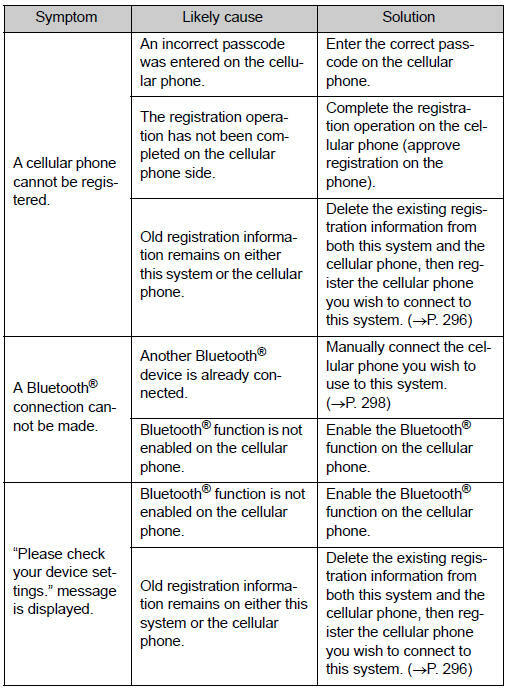 In order to use wireless communication, register and connect a Bluetooth® device by performing the following procedures. 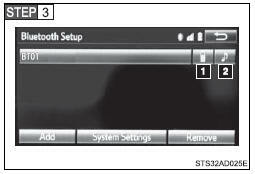 To display the screen shown below, press the “SETUP” button and select “Bluetooth” on the “Setup” screen. Select to connect the device to be used with multimedia system. Select to register a Bluetooth® device to be used with multimedia system. 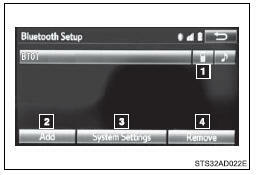 Select to set detailed Bluetooth® system settings. Turn the Bluetooth® connection setting of your audio player on. This function is not available when the Bluetooth® connection setting of your audio player is set to off. Select “ Audio” on the “Select Audio Source” screen. 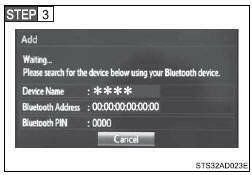 Follow the steps in “How to register a Bluetooth® device” from “STEP 2”. 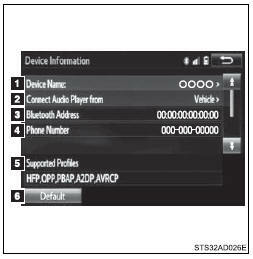 To use the hands-free system, it is necessary to register a Bluetooth® phone with the system. Once the phone has been registered, it is possible to use the handsfree system. Turn the Bluetooth® connection setting of your cellular phone on. Select “OK” to register a phone. Bluetooth® compatible phones (HFP) and portable audio players (AVP) can be registered simultaneously. You can register up to 5 Bluetooth® devices. Display the “Bluetooth Setup” screen. When this screen is displayed, search for the device name displayed on this screen on the screen of your Bluetooth® device. For details about operating the Bluetooth® device, see the manual that comes with it. To cancel the registration, select “Cancel”. Register the Bluetooth® device using your Bluetooth® device. 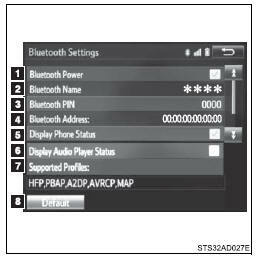 A PIN-code is not required for SSP (Secure Simple Pairing) compatible Bluetooth® devices. Depending on the type of Bluetooth® device being connected, a message confirming registration may be displayed on the Bluetooth® device’s screen. Respond and operate the Bluetooth® device according to the confirmation message. Select “OK” when the connection status changes from “Connecting...” to “Connected”. Registration can be performed from screens other than the “Bluetooth Setup” screen. Display the “Bluetooth Audio” screen. Select “Bluetooth” on the “Setup” screen. To turn auto connection mode on, set “Bluetooth Power” to on. When you register a phone, auto connection will be activated. Always set it to this mode and leave the Bluetooth® phone in a place where a connection can be established. When the engine switch is turned to the “ACC” or “ON” position, the system will search for a nearby cellular phone you have registered. 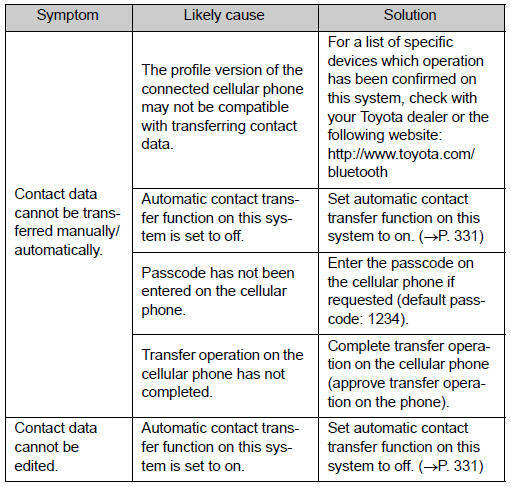 When auto connection has failed or “Bluetooth Power” is turned off, you must connect the Bluetooth® device manually. 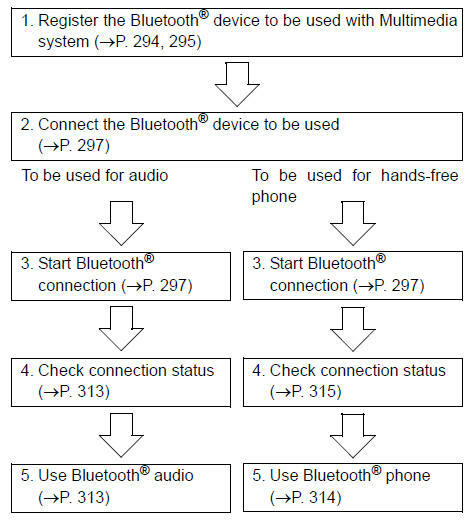 Follow the steps in “Connecting a Bluetooth® device” from “STEP 1”. Select “Select Device” on the “Bluetooth Audio” screen. If the system cannot connect due to poor signal strength with the engine switch in the “ACC” or “ON” position, the system will automatically attempt to reconnect. The number may not be displayed depending on the model of phone. Select “Connect Audio Player from”. “Vehicle”: Connect the multimedia system to the portable audio player. “Device”: Connect the portable audio player to the multimedia system. You can confirm and change the detailed Bluetooth® settings. You can change the PIN-code that is used to register your Bluetooth® devices in the system. Input a PIN-code, and select “OK”. 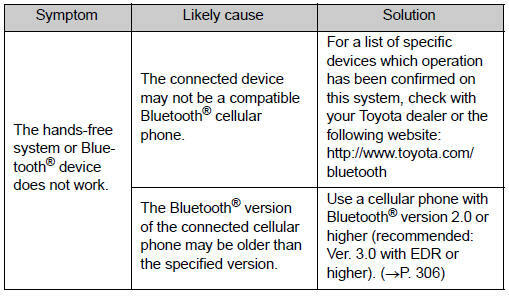 If there is a problem with the hands-free system or a Bluetooth® device, first check the table below. The Bluetooth® word mark and logos are registered trademarks owned Bluetooth SIG, Inc. and any use of such marks by Panasonic Corporation is under license. ●In the following conditions, the system may not function. ●There may be a delay if a cellular phone connection is made during Bluetooth® audio play. ●Depending on the type of portable audio player that is connected to the system, operation may differ slightly and certain functions may not be available. ●The multimedia system is muted when making a call. ●If both parties speak at the same time, it may be difficult to hear. ●If the received call volume is overly loud, an echo may be heard. 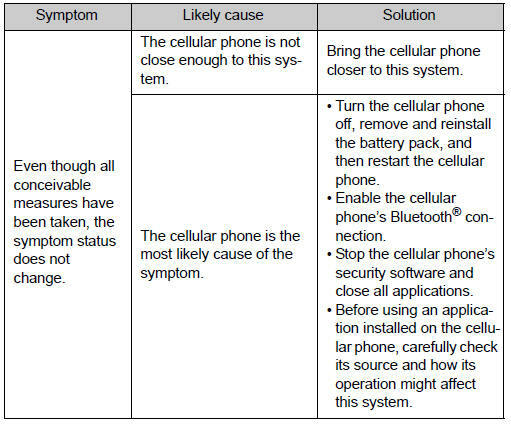 If the Bluetooth® phone is too close to the system, quality of the sound may deteriorate and connection status may deteriorate. ●When outgoing calls are controlled, due to heavy traffic on telephone lines, etc. ●This display may not correspond exactly with the portable audio player or cellular phone itself. ●This system does not have a charging function. ●The portable audio player or cellular phone battery will be depleted quickly when the device is connected to Bluetooth®. ●The Bluetooth® audio connection may be interrupted. ●Noise may be heard during Bluetooth® audio playback. 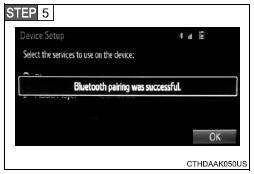 When removing a Bluetooth® phone from the system, the above-mentioned data is also deleted. ●Bluetooth® specifications: Ver. 2.0, or higher (Recommended: Ver. 3.0+EDR or higher) ●Profiles: • A2DP (Advanced Audio Distribution Profile) Ver. 1.0, or higher (Recommended: Ver. 1.2 or higher) This is a profile to transmit stereo audio or high quality sound to the multimedia system. • AVRCP (Audio/Video Remote Control Profile) Ver. 1.0 or higher (Recommended: Ver. 1.4 or higher) This is a profile to allow remote control the A/V equipment. ●Profiles: • HFP (Hands Free Profile) Ver. 1.0 or higher (Recommended: Ver. 1.6 or higher) This is a profile to allow hands-free phone calls using a cellular phone or head set. It has outgoing and incoming call functions. • OPP (Object Push Profile) Ver. 1.1 or higher (Recommended: Ver. 1.2) This is a profile to transfer contact data. When a Bluetooth® compatible cellular phone has both PBAP and OPP, OPP cannot be used. • PBAP (Phone Book Access Profile) Ver. 1.0 or higher (Recommended: Ver. 1.1) This is a profile to transfer contact data. 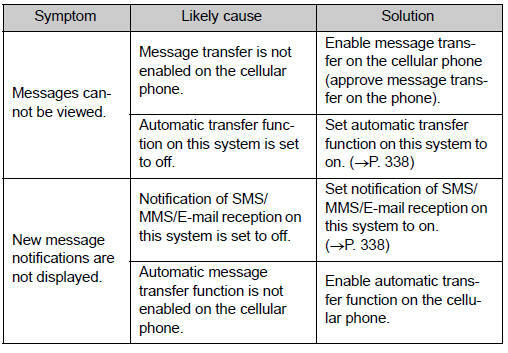 If the cellular phone does not support HFP, you cannot register it with the hands-free system. OPP, PBAP services must be selected individually. FCC ID: ACJ932YEAP01A446 This device complies with Part 15 of the FCC Rules. Operation is subject to the following two conditions: (1) this device may not cause harmful interference, and (2) this device must accept any interference received, including interference that may cause undesired operation. The latest original “DECLARATION of CONFORMITY” (DoC) is available at the address stated. If the portable audio player is disconnected due to poor reception when the engine switch is in the “ACC” or “ON” position, the system automatically reconnects the portable audio player. Radio frequency radiation exposure information: This equipment complies with FCC radiation exposure limits set forth for an uncontrolled environment. This equipment should be installed and operated with minimum distance of 7.9 in. (20 cm) between the radiator and your body. This transmitter must not be co-located operating in conjuction with any other antenna or transmitter. Do not use the portable audio player, cellular phone or connect a device to the Bluetooth® system. ●Your audio unit is fitted with Bluetooth® antennas. People with implanted pacemakers or cardiac defibrillators should maintain a reasonable distance between themselves and the Bluetooth® antennas. The radio waves may affect the operation of such devices. ●Before using Bluetooth® devices, users of any electrical medical device other than implanted pacemakers and implanted cardiac defibrillators should consult the manufacturer of the device for information about its operation under the influence of radio waves. Radio waves could have unexpected effects on the operation of such medical devices.